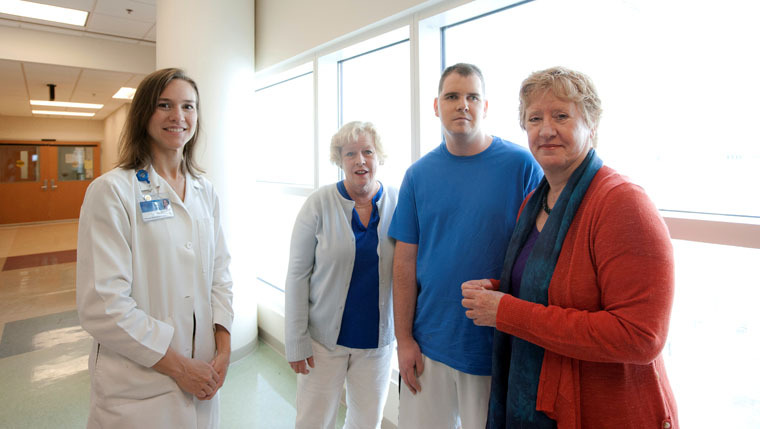 Stroke survivor Sean Bretz with Lisa Lazaraton (left), a physical therapist at Mayo Clinic in Florida, his mother (center) and aunt. It’s been almost three years since Sean Bretz collapsed. Unbeknownst to the then 23-year-old U.S. Coast Guardsman, a giant aneurysm had burst in his brain, causing a massive stroke. Despite complications and issues, which required him to be induced into a medical coma, Bretz made an almost full recovery. “I realize I was lucky and recovered pretty well. A lot of other people who have this type of stroke do not,” says Bretz, who attributes his success to the large team at Mayo Clinic’s Comprehensive Stroke Center. Bretz will graduate from school and begin his new career in April 2015. In the meantime, he’s advocating and educating. He often visits patients at a local rehab facility and was one of the survivors featured in a nationally syndicated public service announcement supporting the American Stroke Association.